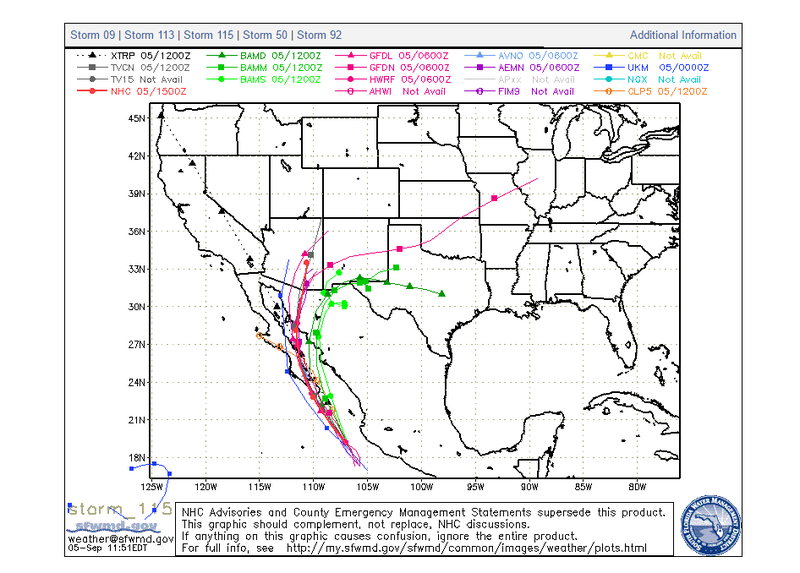 Potential Impacts From Tropical Storm Newton's Remnant Moisture On New Mexico & Nearby Areas This Week. NHC Infrared Satellite Image @ 8:45 AM MDT This Morning. 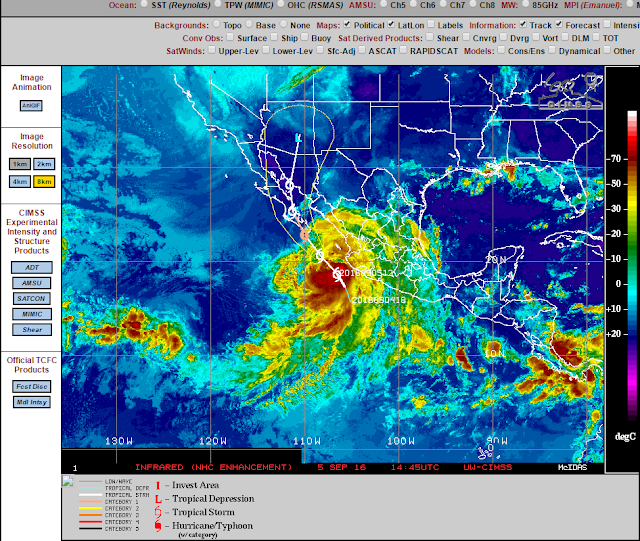 Latest Position @ Strength Of New As Of 9 AM MDT This Morning. NHC Forecast Track Of Newton. 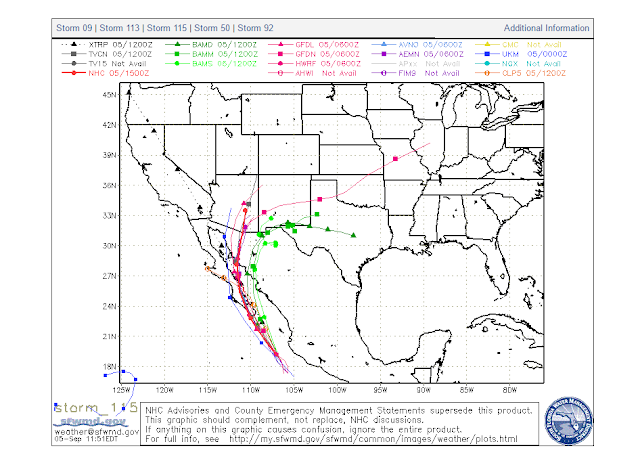 Computer Model Track Forecasts Of Tropical Storm Newton. A couple of things to note about Tropical Storm Newton this morning. 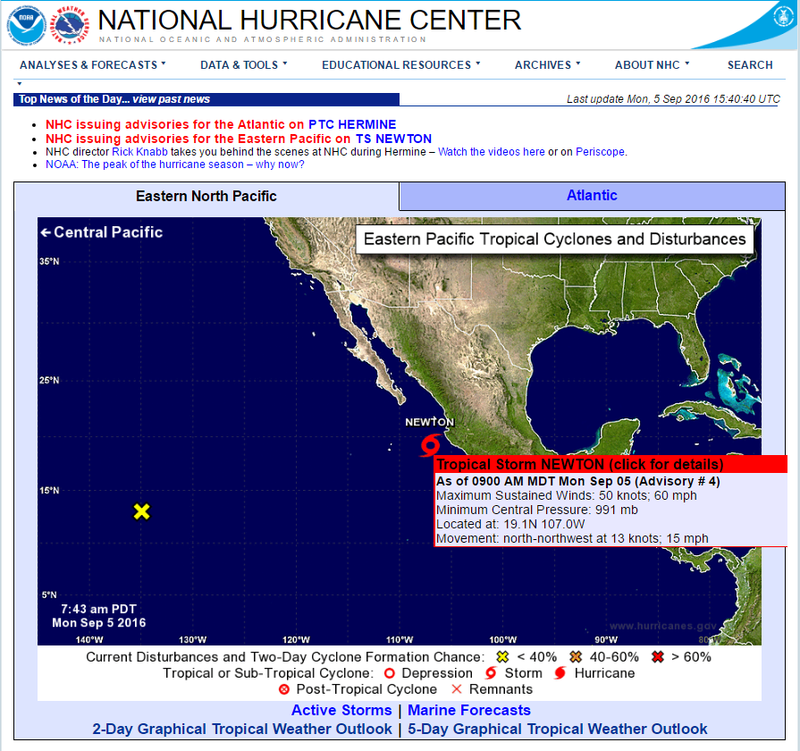 One the storm intensified from a Tropical Depression into a Tropical Storm overnight. Two the National Hurricane Center now expects Newton to strengthen into a Hurricane before he makes landfall along the southern tip of the Baja Peninsula Tuesday morning. Three overall the computer forecast models are starting to shift the storm slightly further to the east or right of its original forecast track. All of these factors will play a role in Newtons remnant moisture upon the local area this week. Western Trough To Determine Newton's Track. Valid @ 6 PM MDT Wednesday, September 7, 2016. 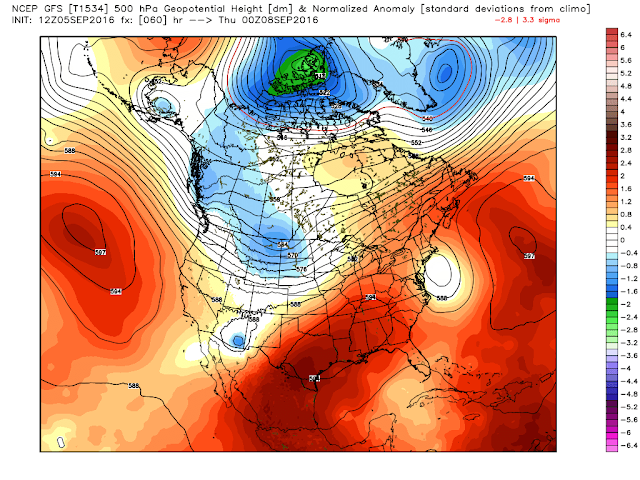 Last Night's 00Z/6 PM MDT ECMWF 500 MB Forecast. Remnant moisture from now Tropical Storm Newton is forecast to spread northward and northeastward over the area Tuesday into the end of the week. Later this week a cold front dropping southward down the east side of the Rockies into the area may also become a player in our local weather and enhance our chances for thunderstorms and heavy rain. Subtle differences in the computer models forecast track of the remnants of Newton sandwiched in between a ridge of high pressure over Texas, and the approaching trough of low pressure to our west will make all of the difference in the world as to who gets the brunt of Newton's remnant tropical moisture and heavy rainfall this week. 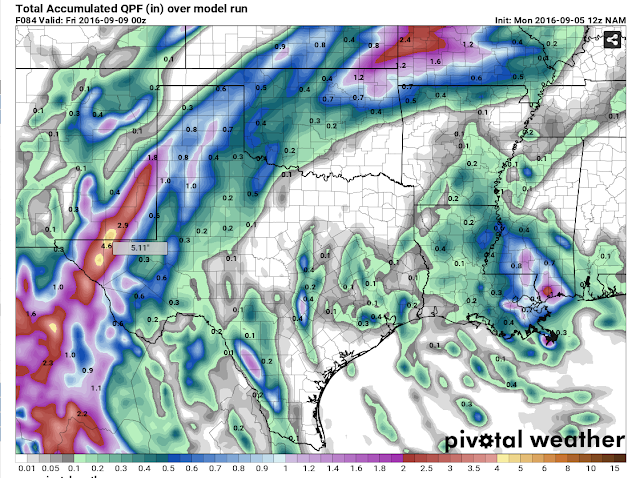 This Mornings 12Z/6 AM MDT GFS Storm Total Rainfall Forecast. Valid @ 6 AM MDT Thursday, September 8, 2016. 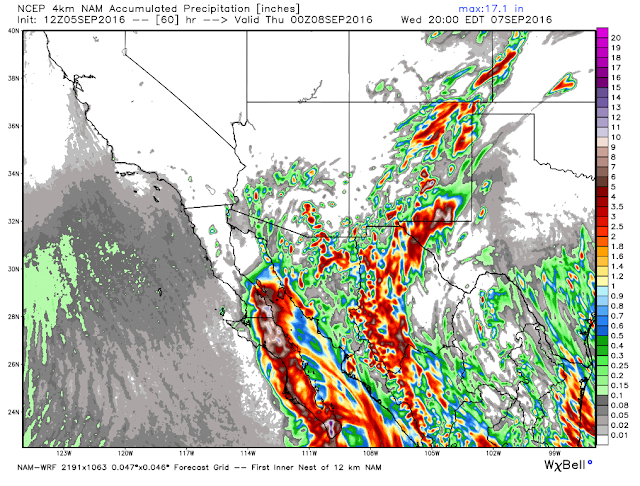 This Mornings 12Z/6 AM MDT NAM-WRF Storm Total Rainfall Forecast. This Mornings 12Z/6 AM MDT NAM Storm Total Rainfall Forecast. 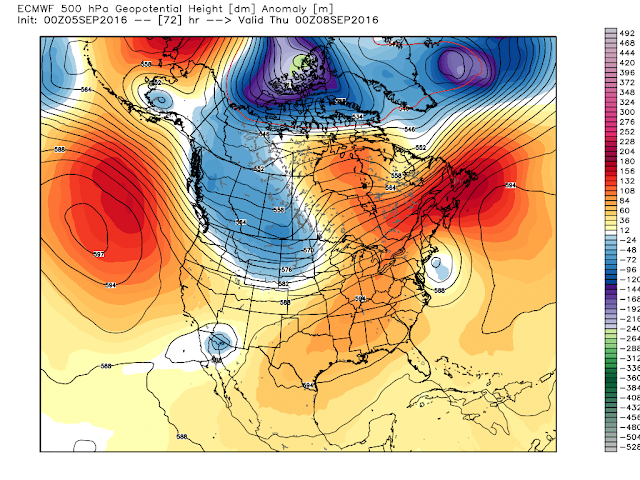 Valid @ 6 PM MDT Thursday, September 8, 2016. This Mornings 12Z/6 AM MDT NAM-4 KM Storm Total Rainfall Forecast. 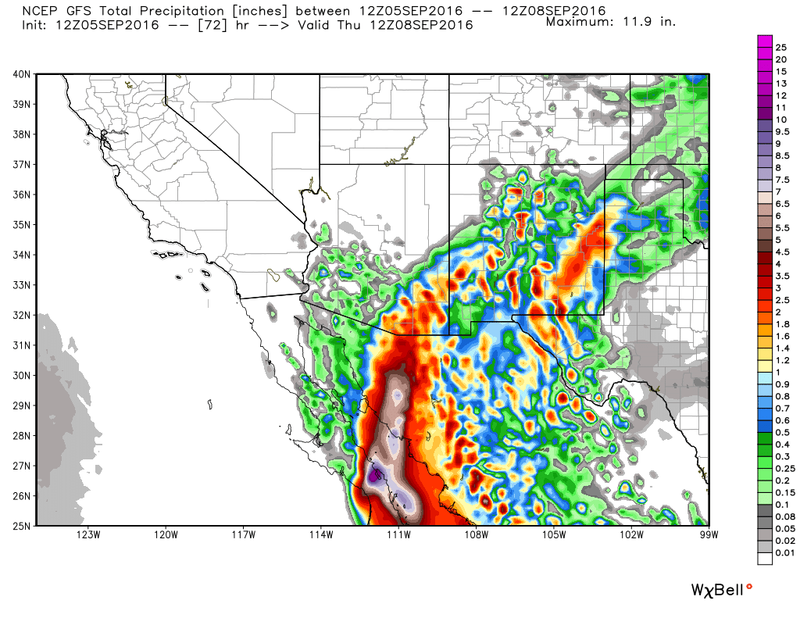 As is normally the case when dealing with tropical systems the models are all over the place with just how much rain is forecast to fall over southeastern New Mexico and when. This is what the models do. Please use them as a general guide and remember that with each new model run we will see changes in the total rainfall amounts and where the heaviest rains will be. But given the current trend of the models and the additional forecasted strengthening of Tropical Storm Newton into a Hurricane before it makes landfall tomorrow morning. 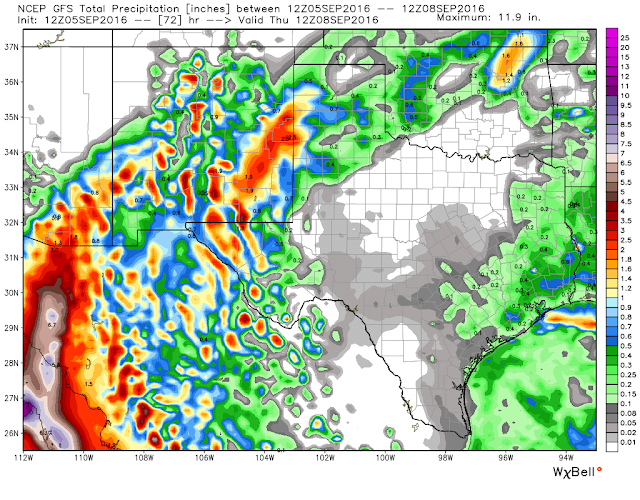 The current thinking is that once again southeastern New Mexico and nearby areas appear to be targeted for more heavy rainfall and possible flash flooding Tuesday into Friday. Storm total rainfall forecasts from this mornings model runs depict anywhere from 2" to 11" of rain over southeastern New Mexico including the Guadalupe, Sacramento, and Capitan Mountains by Thursday. Don't discard this lightly. Tropical systems are notorious for dumping tremendous amounts of rainfall over the local area. Our most infamous flash flood events have been associated with events such as this over the past 130 years. Although just how much rain we are going to get out of this one is not yet certain the prevailing thought is that heavy rains are going to occur! 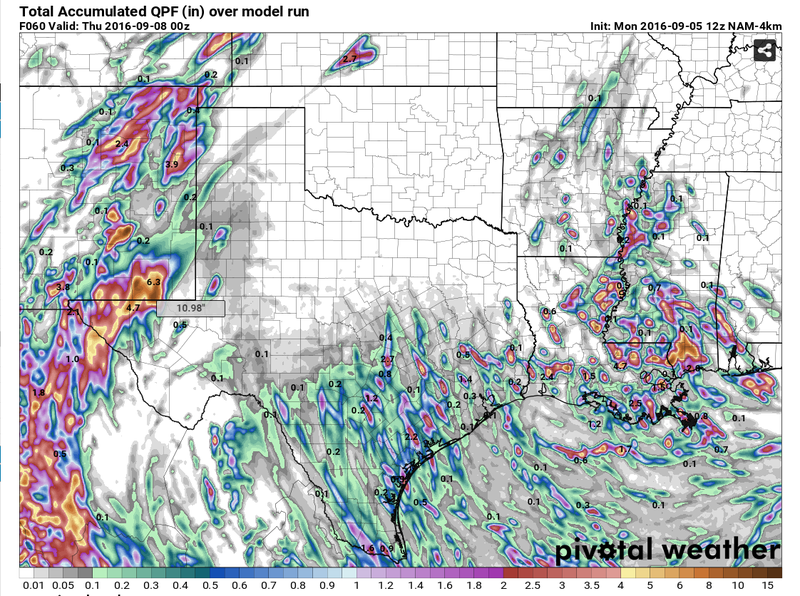 Of concern will again be the mountains and southeastern plains which have received 4" to 10.50" of rain over the past couple of weeks and have experienced several flash flood events. Should the local area once again see this kind of storm total rainfall amounts then an even more significant and widespread flash flood event will occur locally this week. Please keep up to date with all of your local forecasts and be prepared for the possibility of more heavy rains and flash flooding across parts of New Mexico including southern and southeastern New Mexico this week. This also applies to parts of Arizona and West Texas. 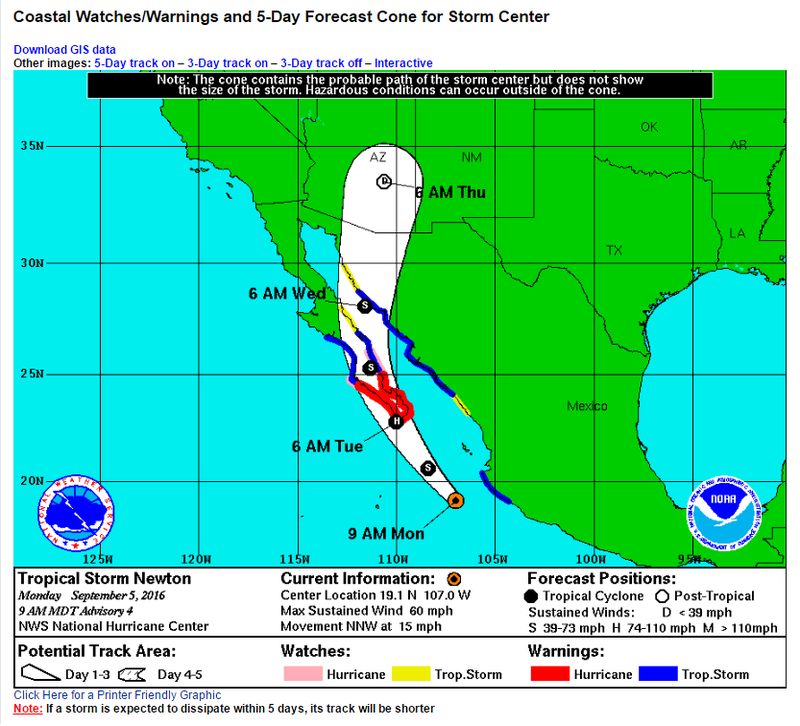 Via The El Paso/Santa Teresa NWS Office.